The Grow-Trees.com team visit to our project site for Sikkim was filled with many firsts. Our project in Sikkim kicked off last year across various project sites in Eastern Sikkim, ranging from Trees for Himalayan Himalayan Forests in Pakyong, Trees for Schools and Monasteries and Himalayan Biodiversity around Dalapchand and Aritar and Trees for Himalayan Monasteries and Forests near Tsomgo lake. The team met our planting partners in Sikkim, interacted with members of the local communities involved in the plantation of trees and saw snow for the first time! Our planting partners welcomed the Grow-Trees team with warmth and a camaraderie we will never forget. The state of Sikkim is known for its commitment to the environment—long before the Swachch Bharat campaign came into existence Sikkim was setting high standards of cleanliness and was fighting plastic pollution on a state-wide level. The state has also pledged to ensure that all vegetable and fruit produce across the state be grown in a clean and organic way. Hence, the support and drive we have seen in our planting partners to green Sikkim comes as no surprise. 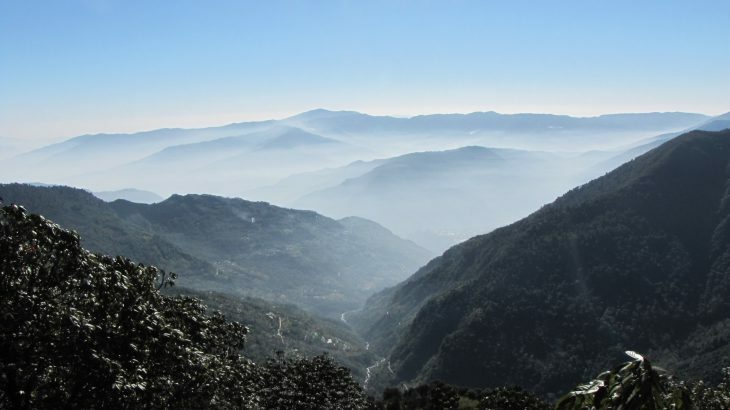 While the state is lush and green to eye, there are parts of Sikkim where tree cover is reducing due to development related activities or for the purpose of preserving secure borders as Sikkim shares international borders with Bhutan and Nepal and bears close proximity to China. YODESS, TPSS and JMFC are our planting partners in Sikkim each handling a different project site in Sikkim. YODESS has helped create green environs around Schools and monasteries around the east district of Sikkim. Their community-based approach to reforestation has helped them implement the plantation activities successfully across hectares of school, monasteries and barren forest land. Their focus is on improving the aesthetics of their stunning monasteries (thereby improving tourism) and engaging local communities by giving them incentive of non-timber forest product that they can use. TPSS that is dedicated to preserving the land around the Tsomgo lake (400 trees per hectare) focuses on preventing siltation and preserving the biodiversity around the lake. An interesting story they shared with us is during times of war or border agitations, the forested land around the borders is cleared for the sake of security. This land is now being reforested in a strategic manner to fight the forces of climate change. JFMC or the Joint Forest Management Committee along with the Eco-Development Committee is responsible for improving the quality of forest lands and implement sustainable management techniques to ensure the forests are not over-exploited by local communities or industry. Their diligent work in forestry has helped Grow-Trees.com plant trees to provide fruit-bearing trees for wildlife and provide arboreal species with adequate habitats. All in all, our experience of witnessing our planting partners in action and visiting the parts of our project sites imbued us with a sense of confidence in the positive outcomes we are creating by working with Grow-Trees.com.